Parents and children alike will appreciate the quality of a well-designed and safe wooden toy, it really is no coincidence traditional wooden toys have been around for generations and are still popular today. 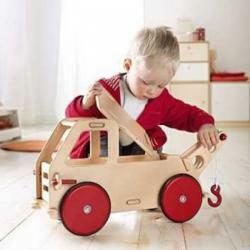 We are proud to offer a varied selection of educational wooden toys, including wooden trucks, shape sorters, chunky puzzles and games from several brands including Tooky Toy, Discoveroo, Classic World, Le Toy Van and more. This fantastic Magic Ball by Classic World is perfect for developing a toddler's dexterity, motor s..
A classic wooden stacking toy with a cute bear head with a beaming smile!The Bear Tower has four ra..
Colourful wooden circles let kids dress this character from tippy toes to top hat. Post on t..
Colourful wooden circles let kids dress this character from tippy toes to top hat.Post on t..
To get going with this eco-friendly Diabolo Toy, hold the wooden sticks in your hands and roll the .. So easy to hold, just shake along with your favourite tunes or make up your own rhythms to play.A h.. Kids will have great fun making silly sounds with this hilarious Slide Whistle from House of Marble.. Your little one will spend ages stacking up these nesting boxes, and placing the farm animals in th..
T.S. Shure Safety Patrol Wooden Magnetic Action Heroes The Safety Patrol Action Heroes Wooden Mag..
A true classic, children will enjoy learning by sliding the beads along the wooden dowel for a visua.. This sturdy wooden activity tree has branches full of exciting things for the eyes and hands to disc.. Balls roll down the track and in and out of sight in this two sided maze. Your little ones will be ..
Two wooden blocks, anchored by strong suction cups underneath to secure it to almost any surface, c..
Make your little ones smile with the lovely beechwood bear rattle finished in soothing shades of blu..
Open the fold out doors and select from a lovely selection of wooden tools; kids will have hours of..
A wooden castanet is a great way to promote fine motor skills and the sense of rhythm.With it’s .. This gorgeous, rainbow coloured wooden counting stacker provides an ideal introduction to basic math..
All little chef’s love to role play and this pretend vegetable cutting activity board will make a u..
Nourish your child’s desire to build and create with this wooden carpentry set with foldable workben.. This beautifully made wooden kitchen set is finished using a unisex pallet of colours so is appealin.. This magnetic puzzle set includes a wooden frame, two play scenes and loads of magnetic puzzle piece..
All little chef’s love to role play, this wooden mixer will have children whipping up delicious tre.. This wooden brightly coloured and fun multifunction music console has all the "bells and whistles" n..
Fighting crime has never been this much fun with our interactive Police Station. Your little o.. This adorable pull along baby hedgehog on wheels would be a great first pull along toy. Perfect for.. This cheerful wooden caterpillar’s body bends and woobles as its pulled along.It’s clever design in..
Our pull along Elephant is the perfect companion for your little one to take on their travels, alway..
Adorable Pull-Along on four wheels with 60cm of hard wearing blue stringOur Elephant Family is the .. This adorable pull along Giraffe on four wheels would pair well with the pull along ZebraPerfect du.. The king of the Savannah would make a great first pull along toy.When pulled, the wooden ball in the.. This cheeky trio of wooden penguins has misaligned wheels to create a cute “bobbing” motion and each.. This adorable pull along Zebra on four wheels would be a great first pull along toy.Perfect for your.. This cute duck push a long will be a great companion for your toddler.Push and pull toys foster ind.. This cute penguin push a long will be a great companion for your toddler.Push and pull toys foster .. This push toy is a classic, listen for the balls inside rolling around while your little one pushes..
Make your little ones smile with the lovely beechwood bear rattle finished in soothing shades of pin.. This wooden magnetic responsibility chart provides a fun and easy way to keep track of children’s ev.. Shape Sorters help promote colour and shape recognition as well as problem-solving skillsEach shape..
Young children will enjoy the challenge this shape tower presents, they don’t get to stack just one .. Encourage pretend and imaginative play and this wonderful wooden toy breakfast set. The two sli..